Handling tomatoes right is important to ensure you get great flavor and a fresh tomato every time, from picking the perfect tomatoes in the produce aisle to making them even tastier in your dishes. Well for starters, never put your tomatoes in the fridge! Mary Ann reminds us to keep them on the counter and if possible, find a large wicker bowl or basket for air circulation to keep them fresh. 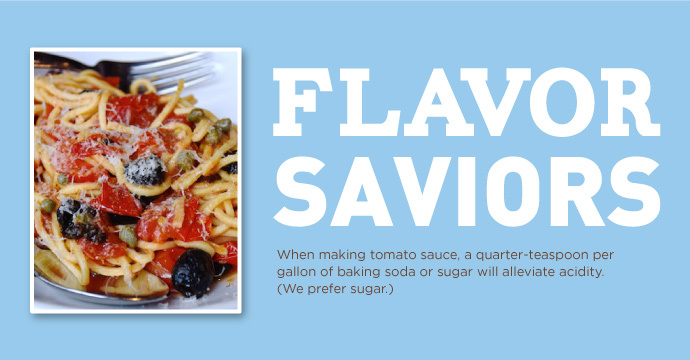 Use all (or most) of your senses to pick out the perfect tomato in the grocery store. The smell, feel and look of a tomato can tell you a lot about its taste. Whether you picked too many to eat at once from your garden or you want to stock up at the store, Mary Ann shows us how to properly freeze tomatoes so they stay nice and juicy. 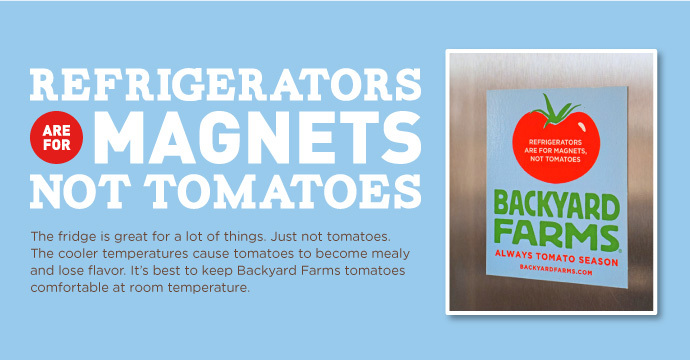 Refrigerators Are for Magnets, Not Tomatoes. The fridge is great for a lot of things. Just not tomatoes. The cooler temperatures cause tomatoes to become mealy and lose flavor. It’s best to keep your Backyard Farms tomatoes comfortable at room temperature. Store Tomatoes in a Bowl or Basket. 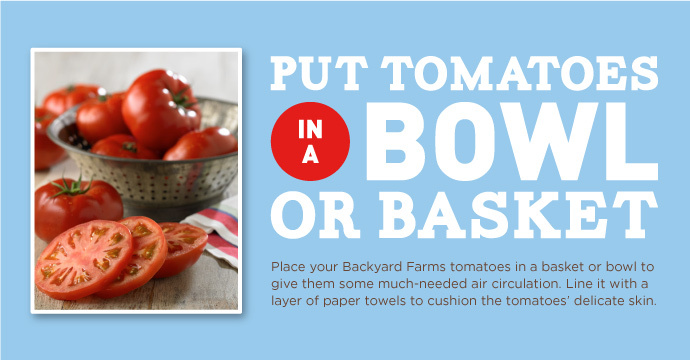 Place your Backyard Farms tomatoes in a basket or bowl to give them some much-needed air circulation. Line it with a layer of paper towels to cushion the tomatoes’ delicate skin. Keep Your Tomatoes to Themselves. Other fruits, such as bananas, peaches and nectarines, continue to ripen after you bring them home. When these fruits ripen, they can trigger tomatoes to continue to ripen, as well. 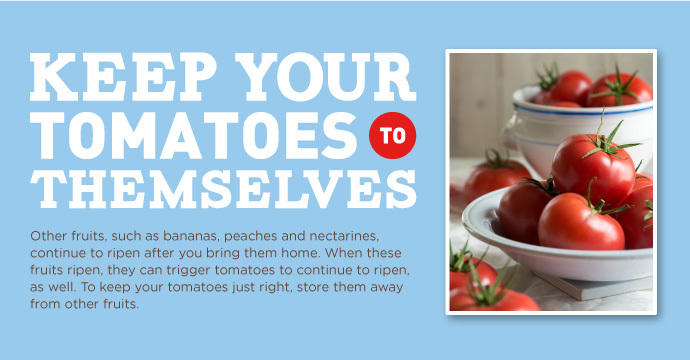 To keep your tomatoes just right, store them away from other fruits. 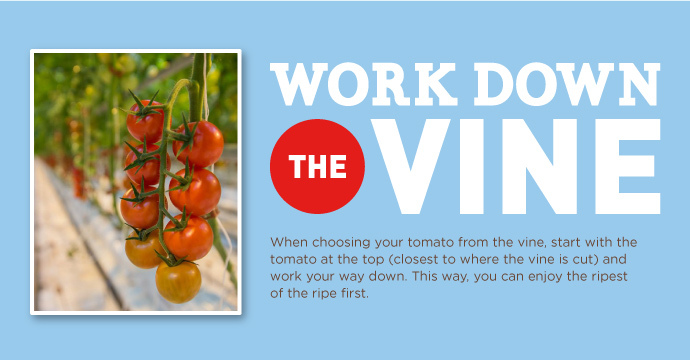 When choosing your tomato from the vine, start with the tomato at the top (closest to where the vine is cut) and work your way down. This way, you can enjoy the ripest of the ripe first. The Way You Slice It. 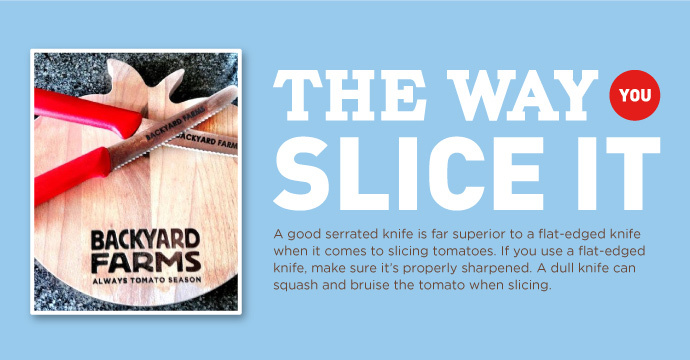 A good serrated knife is far superior to a flat-edged knife when it comes to slicing tomatoes. If you use a flat-edged knife, make sure it’s properly sharpened. A dull knife can squash and bruise the tomato when slicing. Tomatoes and aluminum don’t play nice. The acid in the tomato reacts unfavorably with aluminum pots, pans or utensils, making cooked tomatoes bitter and faded in color. 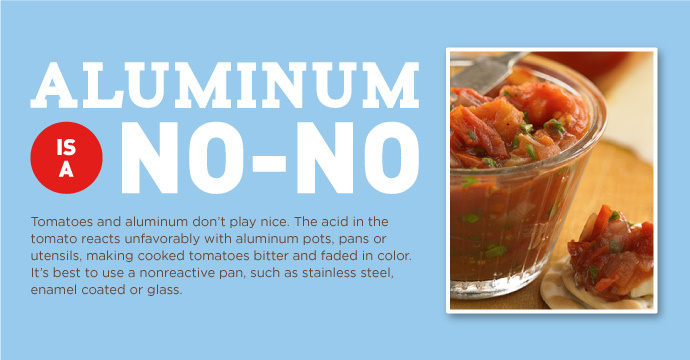 The acid in the tomatoes may also discolor the aluminum cookware. It’s best to use a nonreactive pan, such as stainless steel, enamel coated or glass. 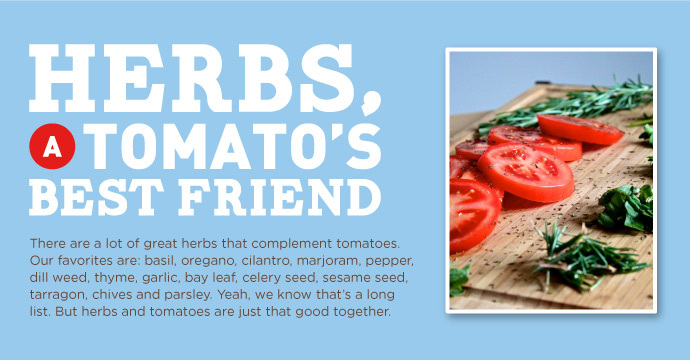 Herbs, A Tomato’s Best Friend. There are a lot of great herbs that complement tomatoes. Our favorites are: basil, oregano, cilantro, marjoram, pepper, dill weed, thyme, garlic, bay leaf, celery seed, sesame seed, tarragon, chives and parsley. Yeah, we know that’s a long list. But herbs and tomatoes are just that good together.